After a major accomplishment, life change or even a spectacular failure... doesn't it seem like there should be bells ringing? Or at least a little chime? I get a "bing" for just receiving new email. Seems like there should be something to signal a major completion. I really wanted to write something about finishing the book... but I still have some editing to complete. I wanted to write about finishing my divorce - the papers are all signed and he moved out his stuff this weekend. And other things too. But it is hard to know when something is truly finished. I just spent three days at my dad's in Massachusetts with my kids, so that my ex could move out all his stuff. I brought the kids to his house, just now, and drove home. I passed four deer watching me from the creepy forest with glowing eyes. Came home to a house that was freezing cold and partially empty. Not completely empty. Just sections. Weird. My impulse to cry warred with my determination to put an "exciting opportunity" spin on the whole thing. These are now my walls. I could repaint! I could move furniture.... (I don't have time!?) I kept saying..."Ok, that's done now. He's out. Finished. On to the next thing." 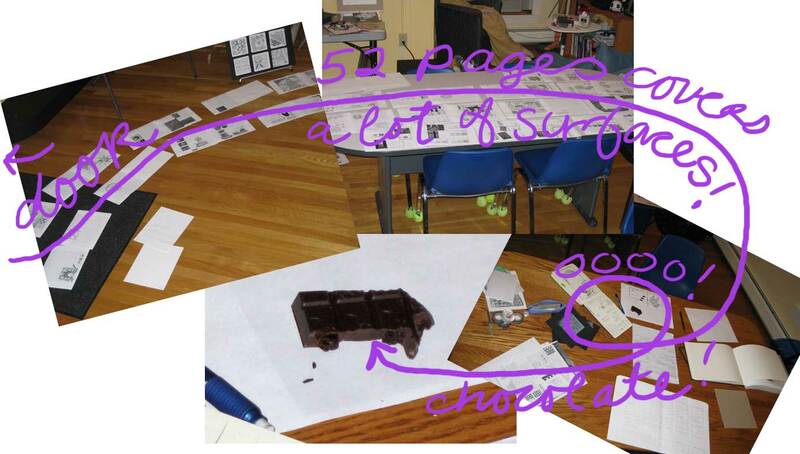 Then I saw the lists of all the stuff he had taken... and all the marks to indicate items he had NOT taken. Meaning... he's coming back for more. It's not done yet. I guess that explains why I didn't hear any bell, right? It just occurred to me that I had written "Came home to a house that was freezing cold..." and my hands really ARE freezing. So I looked at the thermostat and it says "57", but is set to "67". That's NOT good. It's like when you take your car in for a check up - and ten things break the next day. If my life were a movie... there would be some music playing... a theme song? Then I'd scream and run off to Tuscany and buy an old villa. In reality... Oh - there's a bell!.... just the phone. It's the heating guy telling me that the he put ten gallons in the tank last night and it shouldn't have run out already. What?! Does he think I DRANK it or something?! I haven't even been home. "I guess you want me to drive out there again?" No, let's let the pipes freeze so this drama is complete. Egads - I am becoming a silent sarcastic. Turns out, the house was freezing cold yesterday too. While my ex was moving his stuff. He finally noticed at night and called my mother who called the heating people. She was here til after midnight because it was a Saturday night and the repair guy had to come from an hour away - at extra cost. The oil had run out. But I have a contract. No explanation. And the pressure in the furnace was at explosion level... so it was a GOOD thing the oil ran out. So he repaired it. At extra cost. And now, I guess, we will repeat the process tonight. What I really want to do (besides running away to Tuscany) is curl up with popcorn, cocoa and the Roku (sulk a little) and escape my own head. I could not think of a word to sum up my feelings today. Other than AAAAAAARGH! "I have a question about a couple of your drawings in your book Totally Tangled . The one on page 34 in the lower right corner and the one on page 47 lower right corner. Could you email me the directions on how to do these two or put the illustrations on your website? I have looked at these two and really like the way they look. They are very different as though they have fabric just laying on them. Thank you and I really have enjoyed looking at your book and designs." There are two parts to creating a tangle that looks like fabric. Chambray isn't meant to exist on its own. It should have another tangle design overlaid on it. The secret to drawing Chambray is in the shading. 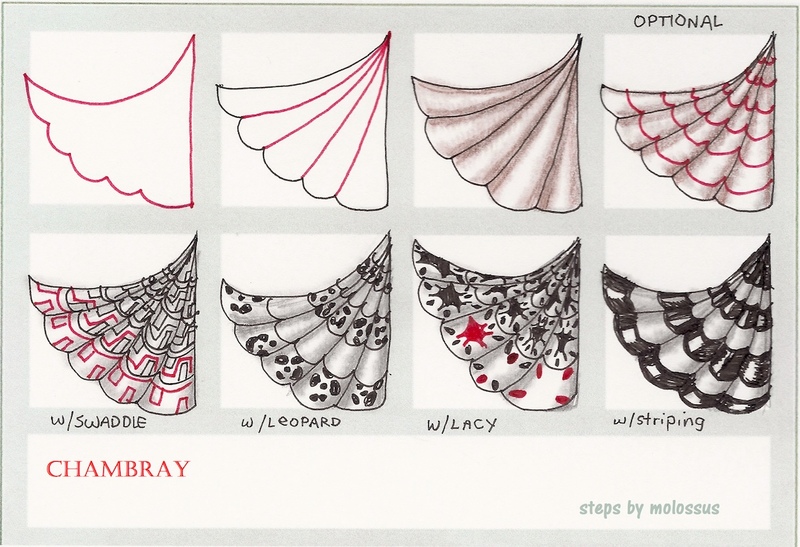 Look at step 3, how the fold line is in the center of the pencil shading. This represents the deepest part of the fold. With a stump or finger, smooth the pencil shading on one side, smoothing to the side, not up or down. Then go to the other side, smoothing in the other direction. Be sure to leave a clean area in the center, which then becomes the highlight at the top of each fold. Now you have this lovely fabric, and want to add a design. Choose simple tangles. With folded cloth, there is distortion of design. If your overlay tangle is too complex, you will lose control of it. Work from the corners inward so that you follow the curve of each square. Accept some distortion, because your squares will not be exact. Note that with Striping, I simply darkened the shading and kept the highlight. 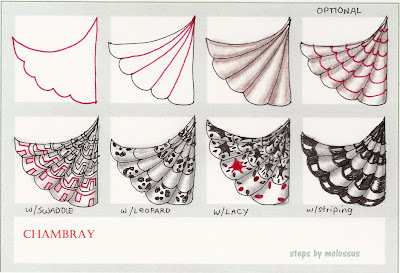 After you overlay the design, if you feel you have lost the up and down of the folds, re-shade along the fold lines from step 2. But smooth lightly. You don't want to lose the highlights. If you have other questions related to the book, I'd love to know how I can help. But also take a look at the Resources section in the back - most of the artists have an email address listed so you can ask them directly about their work. 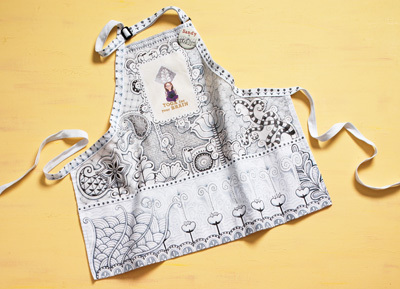 This is my apron in the book! Yeah! No, it's not THE new book - that I'm working on at this VERY moment... but I do have work in it. This is Suzanne McNeill's "Zentangle Fabric Arts - Quilting, Embroidery" . Take a look at her blog for images from the book. There's also info on the Design Originals website. I survived Halloween. I actually LOVE Halloween. But this one was also my 19th wedding anniversary AND the last day of my marriage. Now I get alimony checks and have to get my husband's name removed from all the utility bills. Ex-husband. That's going to take a while to get used to saying! One of my blog readers called him my "was-band"! In honor of the occasion (all of them)... I carved this pumpkin. 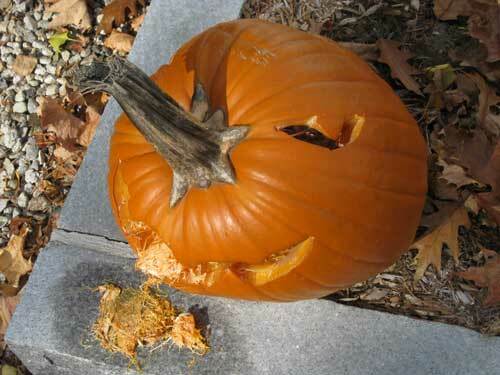 My son said it was "brilliant" and looked like Jack had EATEN another pumpkin. Smirk.